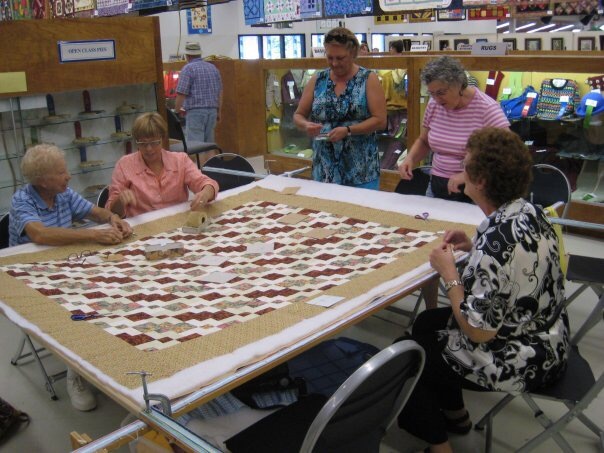 I ran across this old photo of the Puyallup Valley Quilters at the Puyallup fair. My mother and I used to go one of the days and help to tie our charity quilts. It was always such a fun day in September. We loved to be with other quilters, talk to the public about quilting, and to spend some one-on-one time with each other. We would tie quilts for a couple of hours, then head out to get our scones and look at quilts entered in the fair. If we were feeling energetic, we would head over to the flower displays and ooh and aah at the dahlias. Mom usually had a few of her dahlias entered in the displays. So, without further ado, here is our picture. We are with Jenise Doty (pink blouse), JoAnn James (seated) and Patty de Kamp (blue dress). What a special photo and memory of your mom!